Newly published data in the 2016 Annual Report from Marine Harvest, the world’s largest salmon farming company, shows that its Scottish salmon farms lag very far behind its operations elsewhere in the world in controlling the devastating sea lice parasite. 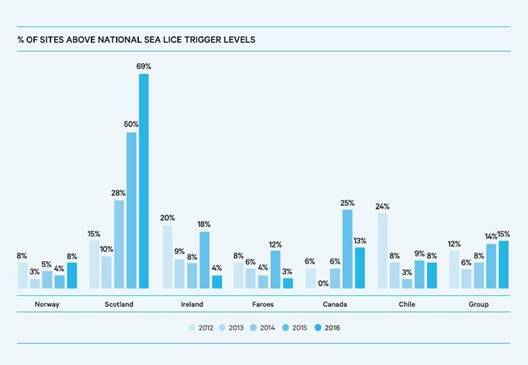 The Report includes a graph indicating that 69 % of Marine Harvest sites in Scotland were above the industry’s Code of Good Practice trigger levels for treatment of sea lice in 2016. The highest figure elsewhere was in Canada where just 13 % of sites were above the national trigger level for chemical treatment. The graph, as published in the Marine Harvest Annual Review, confirms that the situation in Scotland is deteriorating year on year. No other Marine Harvest operation shows such a trend. The quarterly sea lice figures published by SSPO confirm other companies are as bad as, and in some instances worse than, Marine Harvest at controlling sea lice. In recent months the figures for Loch Fyne (Argyll) and Loch Roag (Lewis) have been particularly poor, but Marine Harvest has no farms in either location. The Scottish Salmon Company has ten farms in Loch Fyne and seven farms in Loch Roag. In 2015 S&TC Scotland raised a formal Petition to the Scottish Parliament, which seeks to change the law, firstly to require immediate culls or harvesting of farmed where sea lice numbers have effectively gone out of control and secondly to give fish farm inspectors the legal duty to control sea lice on fish farms, expressly to protect wild fish populations from juvenile sea lice infestation from marine cage fish farms. The Petition is currently being considered by the Scottish Parliament’s Rural Economy and Connectivity Committee.